Dustin Daggett stormed to a milestone 100th Engine Pro Sprints on Dirt Presented by ARP victory with a thrilling 25 lap victory at Hartford Speedway Friday night after a ferocious battle with Ryan Ruhl after a late caution. 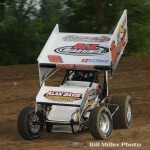 With a light rain trying to interrupt things, the feature was lined up with Ruhl and Brett Mann making up the front row. At the green, Ruhl shot out front with 3rd starting Daggett running side by side early with Brett Mann falling in line 3rd. Lap four found Kirk Cheney getting over the turn four cushion and hard into the wall upside down. Cheney was able to get out on his own to cheers from the crowd. As the green flew again Daggett dive bombed low under Ruhl, but the #16 would have none of it opening a wider lead. Meanwhile, with Ruhl and Daggett putting distance between themselves and Mann in third, racing was intense for fourth with a strong Andy Teunessen, Gregg Dalman, Chase Ridenour, and Brad Lamberson all battling hard. While the lead duo were maneuvering high and low through heavy lapped traffic, laps were quickly winding down. Lap 22 saw the #18 of DJ Lemance encounter some trouble and slowed on the front stretch and attempted to get off the track but spun to a stop to close to the track for racing to continue bringing out the caution. The green appeared for the final time with three to go and Ruhl jumped out front but going into three, Daggett dove under Ruhl to take the lead. Ruhl pulled even and the pair crossed the stripe even with two to go. The final two laps were a dogfight with Daggett getting a slight advantage and taking the checkers to the approval of a very large crowd. At the checkers it was Daggett, Ruhl, Mann, Teunessen and Dalman. 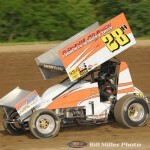 Heats for the 22 cars on hand were won by Daggett, Mann and Ruhl. 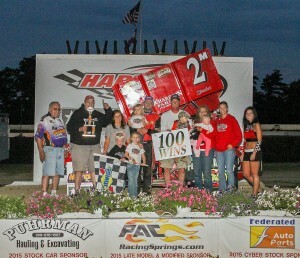 In victory lane, an excited Dustin Daggett thanked his car owner Phil Mott and his family for Sprints on Dirt win #100. 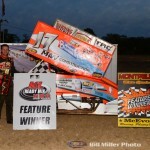 He also claimed Ryan Ruhl had the race won until the late caution and praised him for the hard racing. Comp Cams / Lane Automotive Heat Race #1 (8 Laps): 1. 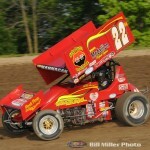 2M – Dustin Daggett, 2. 11R – Chase Ridenour, 3. 7 – Nic Rogers, 4. 27 – Brad Lamberson, 5. 18 – D.J. Lamance, 6. 21 – Kirk Cheney, 7. 70 – Jim Lingar. Kistler Racing Products Heat Race #2 (8 Laps): 1. 19 – Brett Mann, 2. 25M – Ken Mackey, 3. 3R – Shane Ross, 4. 4 – Craig Karazim, 5. 7K – Kyle Pitts, 6. 1A – Mark Aldrich, 7. 20A – Andy Chehowski. Allstar Performance / Engler Machien and Tool Heat Race #3 (8 laps): 1. 16 – Ryan Ruhl, 2. 49T – Gregg Dalman, 3. 31 – Andy Teunessen, 4. 77 – Zane Devault, 5. 23G – Joe Geibe, 6. 19J – Linden Jones. DNS: 24 – Eric Smith. Engine Pro Feature (25 Laps): 1. 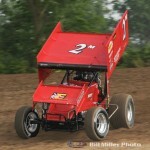 2M – Dustin Daggett, 2. 16 – Ryan Ruhl, 3. 19 – Brett Mann, 4. 31 – Andy Tenessen, 5. 49T – Gregg Dalman, 6. 27 – Brad Lamberson, 7. 11R – Chase Ridenour, 8. 25M – Ken Mackey, 9. 7 – Nic Rogers, 10. 3R – Shane Ross, 11. 77 – Zane Devault, 12. 4 – Craig Karazim, 13. 1A – Mark Aldrich, 14. 23G – Joe Geibe, 15. 70 – Jim Lingar, 16. 20A – Andy Chehowski, 17. 18 – D.J. Lamance, 18. 7K – Kyle Pitts, 19. 19J – Linden Jones, 20. 21 – Kirk Cheney, 21. 24 – Eric Smith. 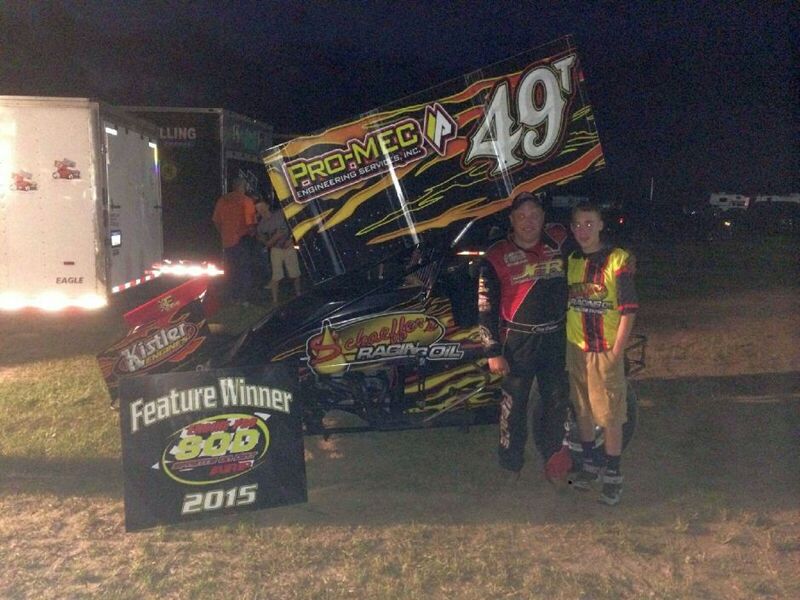 Merritt, MI – (June 20, 2015) – Gregg Dalman won the Engine Pro Sprints on Dirt presented by ARP feature Saturday night at Merritt Speedway. 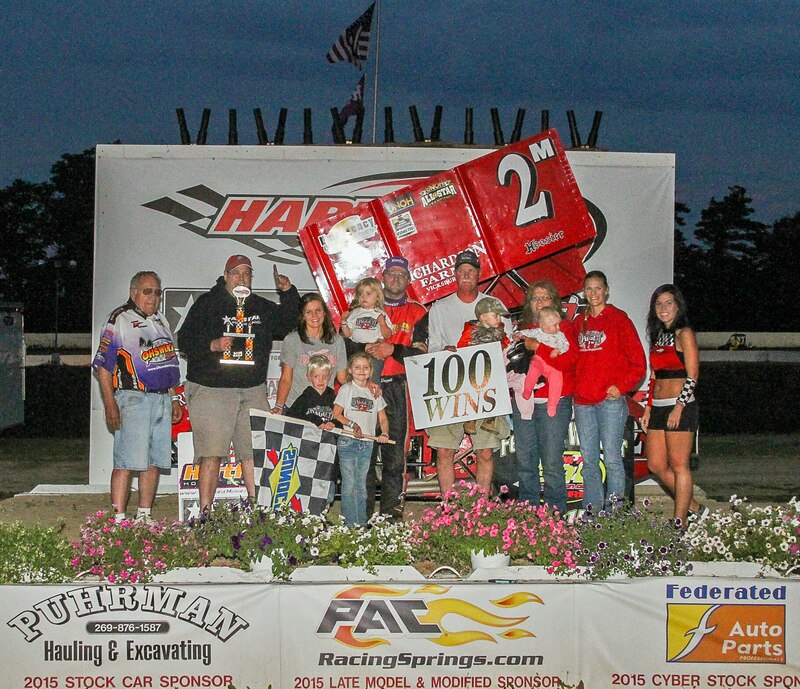 The win was Dalman’s first of the 2015 season. Brett Mann and Craig Karazim started on the front row for the 25-lap feature. Mann led the opening lap, but on the second circuit Mann and Karazim made contact racing for the lead and collected Chase Ridenour. Only Mann was able to make the restart. Dalman took the lead on the restart and motored away from the field. One more caution appeared on lap 12 for Eric Smith slowing on track, but that didn’t stop Dalman to pull away for the victory. Jay Steinebach picked up a career best SOD finish in the runner up spot with Dan McCarron, Mark Aldrich, and Brad Lamberson rounding out the podium. Comp Cams / Lane Automotive Heat Race #1 (8 Laps): 1. 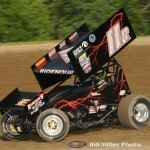 49T – Gregg Dalman, 2. 10S – Jay Steinebach, 3. 1A – Mark Aldrich, 4. 20A – Andy Chewhowski, 5. 27X – Jared Lamberson, 6. 70 – Jim Lingar. Kistler Racing Products Heat Race #2 (8 Laps): 1. 7K – Kyle Pitts, 2. 11R – Chase Ridenour, 3. 22M – Dan McCarron, 4. 24 – Eric Smith, 5. 2R – Ralph Brakenberry. Allstar Performance / Engler Machien and Tool Heat Race #3 (8 Laps): 1. 19 – Brett Mann, 2. 4 – Craig Karazim, 3. 21T – Troy Chehowski, 4. 27 – Brad Lamberson, 5. 3T – Tank Brakenberry. Engine Pro Feature (25 Laps): 1. 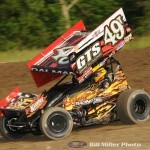 49T – Gregg Dalman, 2. 10S – Jay Steinebach, 3. 22M – Dan McCarron, 4. 1A – Mark Aldrich, 5. 27 – Brad Lamberson, 6. 20A – Andy Chehowski, 7. 21T – Troy Chewhowski, 8. 19 – Brett Mann, 9. 27X – Jared Lamberson, 10. 70 – Jim Lingar, 11. 2T – Ralph Brakenberry, 12. 3T – Tank Brakenberry, 13. 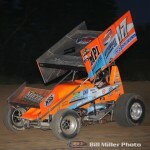 7K – Kyle Pitts, 14. 24 – Eric Smith, 15. 11R – Chase Ridenour, 16. 4 – Craig Karazim. 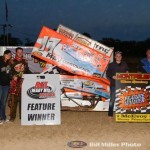 Quincy, MI — (June 13, 2015) — The Engine Pro Sprints on Dirt presented by ARP series was nearly able to complete their entire program Saturday night at Butler Speedway. Unfortunately rain started to fall prior to the feature event, forcing officials to postpone it until SOD’s second appearance of the year at Butler on July 25th. That program will feature the makeup feature and a complete SOD program.